There are many components necessary for life in rural Kansas, and none are more critical than water. A grant from the Hansen Foundation assisted in the repair of a tower that was no longer up to code, and had also become a bit of an eyesore. 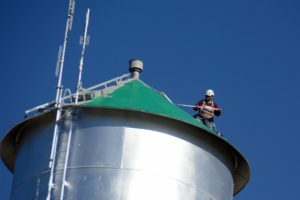 The inside of the water tower was relined, additional repairs were made and the exterior was painted. Timing is everything, to complete the repair work, the water from the tower was drained into the local lake, which helped saturate the ground to help fill the lake when the rains came. The water tower is now up to code and painted the tower to restore its beauty. It really stands out when you see it from the outskirts of town.